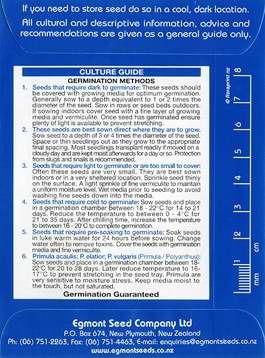 To aid in the germination and healthy growth of your Egmont Seeds products you should carefully follow the “Culture Guide” printed on the back of each seed packet. 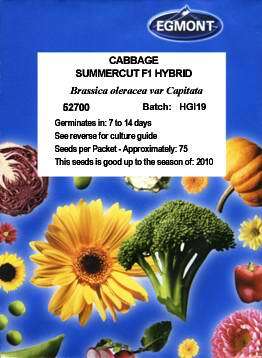 Most seed packets have a “Use Culture Guide #” printed on the front of the packet, this number relates to the method of germination listed on the back of the packet (also listed below). While most seeds fall into one of these six methods some, however, have their own unique germination requirements that are different from the standard six. Therefore, please carefully read the back of each packet to ensure good germination. These seeds should be covered with growing media for optimum germination. Generally sow to a depth equivalent to 1 or 2 times the diameter of the seed. Sow in rows or seed beds outdoors. If sowing indoors cover seed with a fine layer of growing media and vermiculite. Once seed has germinated ensure plenty of light is available to prevent stretching. 2. These seeds are best sown direct where they are to grow. Sow seed to a depth of 3 or 4 times the diameter of the seed. Space or thin seedlings out as they grow to the appropriate final spacing. Most seedlings transplant readily if moved on a cloudy day and are kept moist afterwards for a day or so. Protection from slugs and snails is recommended. Often these seeds are very small. They are best sown indoors or in a very sheltered location. Sprinkle seed thinly on the surface. A light sprinkle of fine vermiculite to maintain a uniform moisture level. Wet media prior to seeding to avoid washing fine seeds down into the media. Sow seeds and place in a germination chamber between 18-22°C for 14 to 21 days. Reduce the temperature to between 0-4°C for 21 to 35 days. After chilling time, increase the temperature to between 16-20°C to complete germination. Soak seeds in luke warm water for 24 hours before sowing. Change water often to remove toxins. Coverthe seeds with germination media and fine vermiculite. Sow seeds and place in a germination chamber between 18-22°C for 20 to 28 days. Later reduce temperature to 16-17°C to prevent stretching in the seed tray. Primula are very sensitive to moisture stress. Keep media moist to the touch, but not saturated.